Who doesn't love a good old pamper in the bath? ... well as a busy mum of two, the bathroom is my sanctuary and I am always on the look out for gorgeous treats to make that chill out time a relaxing and indulgent experience. 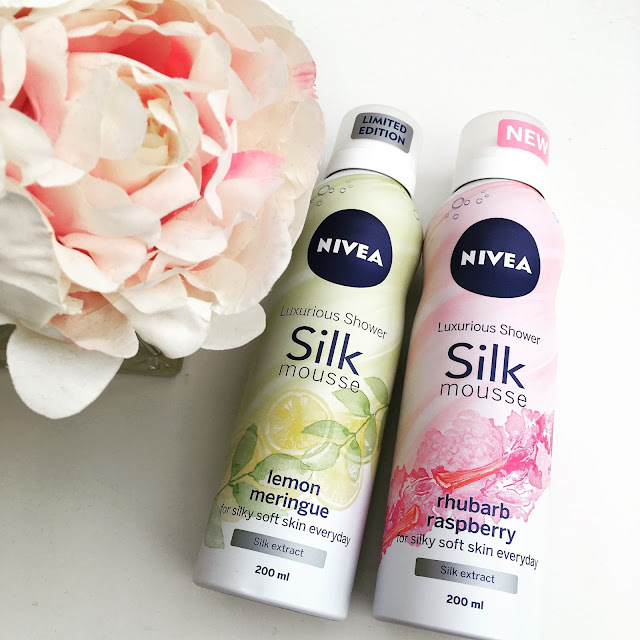 Indulgence and feeling luxurious doesn't have to cost the earth as these lovely silk shower mousses from Nivea prove. In delectable but light scents, Lemon Meringue is slightly sweet but wonderfully zesty, zingy and fresh. Rhubarb Raspberry is a fabulous concoction of sweet berry fruit but with the added tartness of rhubarb that stops it being overpowering and too sweet. I have to say both scents are just gorgeous. Shaking the can ensures the foam comes out rich, thick and firm. Lathering it over the body it covers and envelopes the skin completely with its luxuriousness. Skin is left feeling super silky and soft to touch until your next shower.